This February 17th, a coalition of groups, including 350.org, the Sierra Club, and Hip Hop Caucus, held a rally and march in Washington, DC to raise the urgent issue of climate change. The Sierra Club organized a bus from Chicago – two buses in fact, since the first soon filled. A hundred or so of us, including at least eight from Champaign-Urbana, squeezed onto them and joined thousands of others from around the country heading for DC. 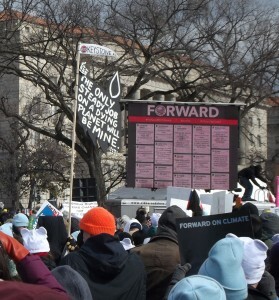 Why did over 35,000 people attend the Climate Forward rally in DC? Well, why did I decide to go? I’ve long felt that addressing climate change is an essential part of our struggles against war and for social justice. It promises to shift their material basis – making food scarcer, exacerbating inequality, increasing competition for water and livable space and arable land. And the burdens will fall far more heavily, and inequitably, on future generations than addressing the problems now will on ours. Further, seeing the Sierra Club’s recent decisions to countenance civil disobedience in the name of opposing climate change, and now to promote the February 17th rally, brought a sort of hope. The Club leadership is politically canny. Putting their reputation on the line this way means, I think, that they see the issue as critical, and that they see the politics as changeable – that such a gesture, dramatically showing public support for climate action, might shift the situation. Anyway, a great rally can be a blast. I had to go. So did half a dozen U of I students from the Stand Up To Coal and Stand Up To Oil campaigns. And a woman with a guitar who tried to lead our bus in song (great fun if you were close enough to hear); Gary, a blind man from Joliet whose guide dog Cuddles bore a Code Pink “Make Out Not War” sign; and my seatmate Idriss, a Sudanese man who spoke among other things about an aspect of changing climate which Sudan has seen for decades: desertification. As we drove east into the snow, the organizers invited anyone on the bus to come up and tell about what had brought them there. One young woman had been working with the 8th Day Center for Justice in Chicago. Her mother saw it: whenever she went to do something with those nuns, she’d get herself arrested. A sour note for me: several speakers, including Michael Brune of the Sierra Club, called on President Obama to lead us. We should know by now not to expect politicians to lead us – it is we, the people, who must lead them. Following the rally came a lively march through the blustery afternoon past the White House, passing a mosh pit with a wolf and polar bear, and the Rosendale, NY Improvement Association Brass Band. Much more happened that day which I couldn’t see. A group of Alberta First Nations people gave a of presentation that evening, while our bus drivers were carrying us, exhausted and chilled but elated, back to Chicago. Many thanks to our bus organizers, Tony Fuller and Ryan Baker, who took good care of us throughout the trip. We didn’t expect President Obama to be in the White House as we marched by that Sunday. We later learned that he’d been in Florida, golfing … with executives from the oil and gas industry. Sure enough, we have to fight.